Our house in Mylapore is popularly known as "Kuruvi Veedu", the reason is, our home served as a shelter to lots of sparrows and my dad is very sentimental about that, he feels happy that those birds are coming into his house without any fear and start building the nests, they even started to breed there. You could see nests just above the TV, corner of the hall, gaps between the ceiling and the pillar which supports the ceiling, just above the fan blades, inside the kitchen shelves, the other vacant areas where there would be no human access. My dad used to do anything that would make those birds comfortable. Once a little sparrow which was practicing flying for the first time, got hurt in our ceiling fan and died on the spot and that incident shook my dad very badly and he removed all the fans from the ceiling and we were forced to spend sweating nights in hot summer. My dad ordered for a bamboo ladder, just to climb up the nest and then check if those little one have eaten or have they slept, he at times used to talk to them and they too respond to him as if they understand his language by replying "quieek quieek". My dad used to keep a pottery which is half filled with boiled water and also a plate of dry rice, so that those sparrows can eat it whenever they wanted to. Whenever they lay eggs and the mother sparrow goes out for hunting, my dad turns to be the mother sparrow, he climbs up the ladder and then keeps an eye on those eggs. He fears that some cats that come by that way might use them for omelet and hence he will keep vigil on those eggs all the time, till the mother sparrow returns. We did not have the habit of keeping alarm at our place, those little ones are our lively alarm, exactly at the strike of 5 they start screeching and before we are served with our dose of morning coffee, those sparrows will be promptly fed with their usual breakfast, couple of grains and a plate of water. Our day actually begins with those sparrows and ends with sparrows. As time went on, those little ones got very close and attached to us, they used to come down from their nests and then started to be with us, they used to sit next to us when we eat, when we watch TV, when we read news papers. Dad got even more closer to them and then started to name each and every sparrow in our house, I still remember one of the sparrow's name was "chellamma" and she seem to be the eldest among the lot, big in sized and feathers. We were not allowed to play any music, we were not supposed to loud our TV volumes, and in short we were not allowed to do anything which would scare those little ones. During diwali times, my dad used to take extreme precaution by covering all those sparrow nests with thermacol, so that they don’t get scared by those crackers. My dad got so obsessed towards sparrows that he took a census on them and every day at night he used to count them and then see if all the sparrows have got back home, even if he sees that one sparrow did not return he gets so worried and then starts praying to GOD for that one little bird to return. Neither the GOD nor those sparrows have disappointed my dad even once. I used to wonder why my dad has developed such affection towards those sparrows and what is so special about them. I used to make fun of him whenever he talks to them by climbing up to their nest. My thoughts of thinking those sparrows as "dumb" birds got changed completely on the day my dad died. My dad's body was not only surrounded by humans, it was also surrounded by those sparrows, they all maintained pin drop silence, and was still in their positions, not even one turned its head the other way, every bird was looking at my dad's body, they did not dare to step on him, and when I offered all of them their usual plate of rice and bowl of water, not even one bird cared to eat or drink. They were actually mourning for my dad's death literally, even I had my lunch in the evening after cremating my dad's body, but those little birds refused to do that for almost 3 days. Days rolled on and we were forced to sell that house to an "apartment" builder as we don’t have any other option other than selling it for our financial gains. As if those little ones already knew that, they all started vacating their 40 year old house and one fine day when we checked all the nests, it was all empty. I think they don’t want to be there to see their house being demolished, more than their house; they don’t want their master's house to be destroyed. Little Ankita was all ears when her grand mom narrated this story and she told her that she has seen that bird in her science book. Yes, our children will not be in a position to see that cute and energetic little bird. While we humans are so greedy to occupy every centimeter of this earth, we fail to understand that it is also a place for those innocent birds to live. Apartment can never be the place for those birds to come in and construct their nests and no one will have the courtesy to feed them amidst of their tight and busy lifestyle. Recent survey and analysis states that heavy usage of cell phones and their radiation have brought this little secies almost to the verge of extinction. Let’s be a bit environment friendly and then reduce the usage of cell phones and give way for such cute little birds to live with us. 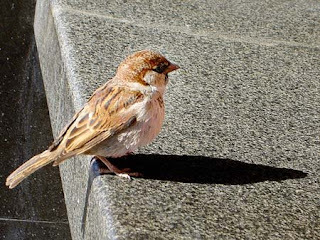 I dedicate this story to a little sparrow family which has just occupied the balcony in my "apartment" and I am here to take care of them at any cost.